The MK Gun series are a high speed and premium style applicator used in graphics and some various packaging applications. The MK Guns are “air open and air closed” and use the H-100 style mini-module. These applicators can be used with general packaging grade, PSA Pressure sensitive and Fugitive adhesive at temperatures from 93°C(200°F) up to 190°C(375°F). These guns are compatible with Nordson Mini Blue series. The MK Guns are only available in single module configurations. The MK Gun series offers two module options. The standard module is a zero cavity mini-module that provides extremely fast and accurate bead placement with any style adhesive. 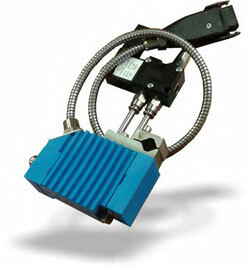 The optional module is a mini-module that uses the standard nozzles for the H-200 series modules. This is a 3/8”-24 thread and is typically used in place of the zero cavity module when multiple beads are required. Each MK Gun is configured with a 220-240VAC heater cartridge. The wattages vary depending on the size of each manifold. Special sized heater cartridges are use in the MK Gun. The MK Guns come standard with a clamp for ½” round bar or hex bar stock. There are 3/8”round bar bracket clamps available and can be purchased separately. If additional brackets are required, please request as additional item. All MK Guns are fitted with a 4-way solenoid and pre-plumbed from the factory. The solenoids are 24VDC and can be fired from any PLC and/or most existing pattern controls. They require compressed air at a pressure of at least 60PSI to lift the needle off of the seat which allows the adhesive to flow through the valve and onto the product. The MK Guns typically use 6mm or 1/4” tubing.